Just over 1,000 supporters turned out last night to see the youth team beat Gateshead 1-0 in the National League U19 Alliance Cup. The only goal of the game came in the first half from Cain Noble. A great sum of £12,800 was raised on the night taking the total collected in the last six days to £35,000. Four new members, Simon Olorenshaw, Mark Howell, Jeff Banks and Calvin Hughes, have been co-opted onto the Chester FC board following last night’s meeting. Olorenshaw previously held the post of chairman while the other three have served as directors before. Richard Lynes will also take on the role of non-executive Director. One other member of the board, David O’Toole has resigned his position. Chester FC’s youth team entertain Gateshead FC in the National League U19 Alliance Cup on Wednesday 31 January, kick-off 19.00hrs. Admission to the game is free but please get along and give these young players the support they deserve and make a donation at the turnstile to help save the Blues. Chester FC are holding an open meeting at 14.00hrs this Saturday in the Blues Bar at the ground. There will be an update on the weeks fundraising efforts as well as updates from the working parties set up last week. All are welcome to attend and CFU membership will no doubt be available on the day. Three directors, chairman Jonny Hughes, vice-chairman Neil Bellis and Anne Salmon have resigned from the Chester FC board with immediate effect. Tonight’s board meeting at the club will go ahead with the remaining members. Several players who are on two year contracts will need to leave the club in order to cut costs. One player, goalkeeper Alex Lynch has already left. Money is due to the club from the tribunal hearing on the James Alabi sale to Tranmere Rovers last summer, this will be heard on 15 February. A second payment from Leicester City for Sam Hughes is also due in a few months and it is believed the club may ask if this can be brought forward. Four working groups have been set up to oversee Strategy, Football, Membership and Commercial. Former CFU chairman Simon Olorenshaw will head the Strategy group and former club secretary Calvin Hughes looking after Football. “CFU members received a full and detailed update from financial director Laurence Kirby on Thursday evening in a meeting at the Swansway Chester Stadium. That update advised that a budget deficit means the club is forecasting a significant loss this season. As a consequence of this, the club has had to utilise its reserves and faces the prospect of growing cash flow pressure between now and end of the 2017/18 season. We recognise and understand this will be a cause of great concern to supporters and there are questions that will need to be answered in time. However, our immediate and total focus must be on overcoming this challenge and protecting our club. This has already commenced with the formation of working groups covering four areas of work: football; strategy; membership (including fan engagement and community), and commercial (including fundraising). Each working group includes people from outside the board and has been given short-term targets. These groups will be meeting regularly over the coming weeks and months to develop clear plans to address the present financial situation and ensure our club has a future. Now we have to move forward. We are the custodians of this football club and each of us can play our part in this battle. The response during Thursday’s meeting and overnight has been heartening and again demonstrates your incredible passion for our club. Thousands of pounds have already been raised and we have received an influx of new CFU members. Support: Chester FC’s youth team host Gateshead FC in the National League U19 Alliance Cup on Wednesday, January 31 at the Swansway Chester Stadium (7pm kick-off). Admission to the game is free but we ask you to turn out in force and give these boys the support they deserve and make a donation at the turnstile. The club’s Chief Executive Officer Mark Maguire is to leave Chester in April after CFU announced that the position at the club is to be made redundant. Maguire has been in the post since June 2016. A goal from Harry White on 77 minutes brought Chester a point from last night’s 1-1 draw with Hartlepool United. Visiting ‘keeper Scott Loach made three fine saves late in the first half to deny the Blues a lead at the interval. Michael Wood had given Pools the lead from close range on 62 minutes before White struck for a deserved equaliser, his fourth goal in four league matches. The point leaves Chester third from bottom and four points from safety. On Saturday the Blues make their first every visit to Maidenhead United, kick-off 15.00hrs. The next CFU members meeting will take place this Thursday 25 January at 19.30hrs in the Blues Bar. New members are welcome to join on the night, lapsed memberships may also be renewed. For those who can’t attend but would like a link to the online streaming please email Neil Bellis neil.bellis@chesterfc.com for an access code. The home game with Dover Athletic will now take place on Tuesday 6 March, kick-off 19.45hrs. Chester poor home league form continued when they were beaten 3-1 at home by Gateshead on Saturday. The visitors took advantage of some dreadful defending to score twice in the final minute of the first half to put the game beyond the Blues. Heed added a third in the second period before Harry White added a consolation goal on the hour mark. Manager Marcus Bignot handed a debut to new signing Shepherd Murombedzi, who was replaced at half-time by Craig Mahon. The Blues slip to third from bottom following this defeat, they are next in action on Tuesday night with a home game against Hartlepool United, kick-off 19.45hrs. Midfielder Tom Shaw has left Chester to join Tamworth on an 18 month contract. Shaw had been at Chester for two and a half years and made 94+14 appearances, scoring 12 goals for the Blues. Cheater have signed 23-year-old wing-back Shepherd Murombedz after he was released by Solihull Moors. Murombedz joined Moors from Hayes & Yeading in 2016 and made nearly 70 appearances for the side. It was announced that former Chester player Cyrille Regis sadly died today. Regis will go down as one of the greatest players to pull on a Chester shirt and although he is best remembered as an England international and centre forward with the likes of West Bromwich Albion and Coventry City he will always be held with great affection by Blues fans after making 29 league appearances for the club in the 1995/96 season. Chester were knocked out of the FA Trophy at the second round stage on Saturday when they lost 1-0 at Conference south side East Thurrock United. Calvin Ekpetita scored the only goal of the game on 17 minutes, as Chester, second best throughout had Sam Hornby to thank for keeping the score down with a series of fine saved. 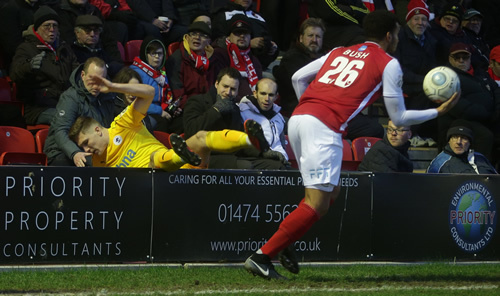 The Blues could muster one real scoring chance in the 90 minutes when substitute Gary Roberts set Ross Hannah through on goal with a delightful pass only for the forward to shoot tamely at the onrushing Lukas Lidakevicius in the home goal. Moments later Roberts debut was cut short after just nine minutes when he was shown a straight red card for a foul on Max Cornhill. The home game against Dover Athletic on Saturday 3 February has been postponed to to the Kent sides involvement in the FA Trophy that day. Chester have completed the signing of 30-year-old midfielder Gary Roberts. Blacon born Roberts recently left Conference North side Southport. He began his career at Crewe Alexandra where he made over 120 appearances for the Railwaymen, he has also appeared for England at a number of levels up to the under17 side. He has played for several clubs since leaving Alex in 2009 notably Yeovil Town, Rotherham United and Port Vale. Both Nyal Bell and Daniel Udoh have ended their loan spells at Chester. Bell returns to Gateshead and Udoh to Crewe Alexandra. Harry White scored his first league goal for Chester on Saturday as the Blues bagged three precious points at Ebbsfleet United. The home side had the majority of the play throughout but Chester’s defence, with Sam Hornby making some great saves in goal, held firm and White’s first half effort was enough to secure the three points. Chester remain in the bottom four but have closed the gap to safety to six points with a couple of games in hand, starting with a trip to AFC Fylde on Tuesday night, kick-off 19.45hrs. The home league game against Hartlepool United, postponed before Christmas due to a waterlogged pitch, has been rearranged for Tuesday 23 January, kick-off 19.45hrs. A last minute equaliser from Guiseley denied Chester a winning start to the new year. The Blues were on course to avenge the Boxing Day home defeat by the Lions when Kingsley James fired them ahead on the hour mark. However with the game already in stoppage time Ash Palmer drilled the ball home through a mass of players in the six yard box to grab a point. It was an improved performance from the Blues who were well beaten by their opponents days earlier. Chester travel to tenth placed Ebbsfleet United on Saturday and follow that up with another away match at AFC Fylde the following Tuesday night.